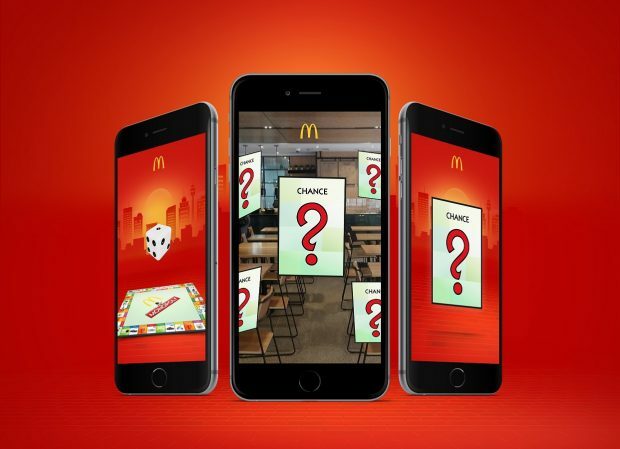 McDonald’s Australia has launched a world-first mobile experience for its largest promotion with the Monopoly Game at Macca’s app. McDonald’s Australia has launched a mobile app for its largest promotion, with the ‘Monopoly Game at Macca’s’ app, turning the promotion into a mobile gaming experience that converges the digital and physical worlds. Building on the existing ‘peel and reveal’ mechanic, customers can now also play digitally by scanning a ‘Chance Card’ for another chance to win something. The home screen of the app also doubles as a virtual game board allowing players to scan and stash all of their property cards. The player’s ‘stash’ becomes a digital wallet for both major prizes and instant win food offers that you can swipe-to-redeem in restaurant at any McDonald’s across the country. The app was created with VML and features three augmented-reality game mechanics. ‘Tap to Play’ sees game cards fly into the real-world via the phone’s camera and augmented reality before letting players choose a card to ‘Tap’ for the chance to win. ‘Spin to Win’ brings a more physical challenge to life where players spin the card in the hope of uncovering prizes. Finally, ‘Dice Roll’ challenges players to roll a perfect combination to land on prizes on the virtual monopoly game board. 24 hours after launch, the ‘Monopoly Game at Macca’s’ app reached the number-one position on the free app chart on the App Store. After 46 reviews it has an average review of two stars out of five. The company says it’s generated over 200,000 winners already.